High-Fidelity DNA Polymerases are important for applications in which the DNA sequence needs to be correct after amplification. Phusion High- Fidelity DNA Polymerase offers both high fidelity and robust performance, and thus can be used for all PCR applications. Its unique structure, a novel Pyrococcus-like enzyme fused with a processivity-enhancing domain, increases fidelity and speed. Phusion DNA Polymerase is an ideal choice for cloning and can be used for long or difficult amplicons. With an error rate >50-fold lower than that of Taq DNA Polymerase and 6-fold lower than that of Pyrococcus furiosus DNA Polymerase (1), Phusion is one of the most accurate thermostable polymerases available. Phusion DNA Polymerase possesses 5´→ 3´ polymerase activity, 3´→ 5´ exonuclease activity and will generate blunt-ended products. 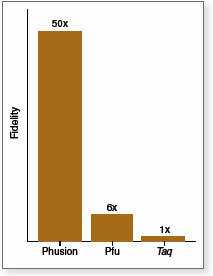 Phusion High-Fidelity PCR Master Mix with GC Buffer offers robust performance and can be used for all PCR applications. It is a 2X master mix consisting of Phusion DNA Polymerase, deoxynucleotides and reaction buffer that has been optimized and includes MgCl2. All that is required is the addition of template, primers and water. Fidelity assays were performed using alacI-based method modified from Frey& Suppman, 1995. A 3.8 kb fragment was amplified from 50 ng of Jurkat gDNA using different polymerases. Reactions were carried out according to the manufacturer's recommended conditions. Extension times are indicated (in minutes). Ladder L is a 1 kb DNA Ladder. Robust Reactions - maximal success with minimal optimization. High Yield - Increased product yield using minimal amount of enzymes. Versatile - can be used for routine PCR as well as long or difficult templates. 25 mM TAPS-HCl (pH 9.3 @ 25°C), 50 mM KCl, 2 mM MgCl2, 1 mM β-mercaptoethanol, 200 μM dNTPs including [3H]-dTTP and 15 nM primed M13 DNA. One unit is defined as the amount of enzyme that will incorporate 10 nmol of dNTP into acid insoluble material in 30 minutes at 74°C. 1X Phusion High-Fidelity PCR Master Mix with GC Buffer, DNA template, 0.5 µM primers and 3% DMSO (optional) in a total reaction volume of 50 µl. Products specifications for individual components in the Phusion High-Fidelity PCR Master Mix with GC Buffer are available separately. Have the formulations or any other characteristics of these products changed now that they are manufactured by NEB? Can I continue to use the same reaction conditions if I use Phusion® products with the new product numbers? Are the prices and sizes of these products the same now that they are manufactured by NEB? 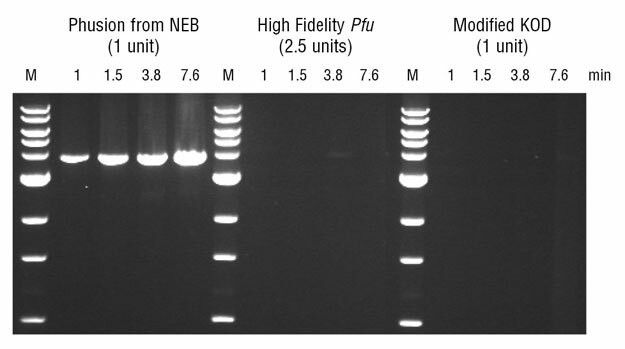 Why are there low molecular weight discrete bands on an agarose gel after a PCR using Phusion® High-Fidelity PCR Master Mix? What should my primer concentration be when using Phusion® High-Fidelity DNA Polymerase/Phusion® High-Fidelity PCR Master Mix? Why are there high molecular weight smears or DNA in the wells of an agarose gel after a PCR using Phusion® High-Fidelity DNA Polymerase? What is the error rate of Phusion® High-Fidelity DNA Polymerase? I am having trouble amplifying a template that is longer than 5kb. How can I optimize my product yield using Phusion® High-Fidelity DNA Polymerase? Phusion has different annealing temperature requirements than most PCR enzymes. Please check out www.neb.com/tmcalculator to help you determine your optimal Phusion annealing temperature. Phusion® DNA Polymerase was developed by Finnzymes Oy, now a part of Thermo Fisher Scientific. This product is manufactured by New England Biolabs, Inc. under agreement with, and under the performance specifications of Thermo Fisher Scientific. Limited license. The purchase price of this product includes a limited, non-transferable license under U.S. and foreign patents owned by BIO-RAD Laboratories, Inc., to use this product. No other license under these patents is conveyed expressly or by implication by purchase of this product. THERMO SCIENTIFIC® is a registered trademark and property of Thermo Fisher Scientific.